DUBAI (Reuters) - Iran has discovered an unexpectedly high reserve of uranium and will soon begin extracting the radioactive element at a new mine, the head of Iran's Atomic Energy Organization said on Saturday. Any indication Iran could become more self-sufficient will be closely watched by world powers, which reached a landmark deal with Tehran in July over its program. They had feared the nuclear activities were aimed at acquiring the capability to produce atomic weapons - something denied by Tehran. "I cannot announce (the level of) Iran's uranium mine reserves. The important thing is that before aerial prospecting for uranium ores we were not too optimistic, but the new discoveries have made us confident about our reserves," Iranian nuclear chief Ali Akbar Salehi was quoted as saying by state news agency IRNA. 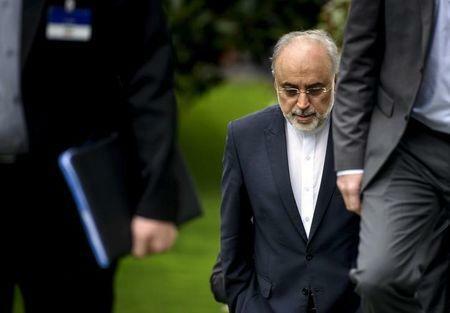 Salehi said uranium exploration had covered almost two-thirds of Iran and would be complete in the next four years. Uranium can be used for civilian power production and scientific purposes, but is also a key ingredient in nuclear weapons. The July deal between Iran and world powers will lift international sanctions on Iran in exchange for at least a decade of curbs on the country's nuclear activity. The U.S. State Department said any new reserves of uranium discovered in Iran will be under the same monitoring as existing mines under the nuclear agreement. "Any violation of that commitment would be met with the appropriate response,” State Department spokesman John Kirby said in a statement. After decades of effort, Iran - which has consistently said its program is for peaceful purposes - has achieved a full nuclear fuel cycle, ranging from the extraction of uranium ore to enrichment and production of fuel rods for nuclear reactors. Sanctions on companies taking part in Iran's uranium mining industry will be lifted when the agreement is implemented. Salehi said uranium extraction was set to begin at a new mine in the central province of Yazd, according to IRNA. Some Western analysts have previously said that Iran was close to exhausting its supply of yellowcake - or raw uranium - and that mining it domestically was not cost-efficient. A report published in 2013 by U.S. think-tanks Carnegie Endowment and the Federation of American Scientists said the scarcity and low quality of Iran's uranium resources compelled it "to rely on external sources of natural and processed uranium". It added: "Despite the Iranian leadership's assertions to the contrary, Iran's estimated uranium endowments are nowhere near sufficient to supply its planned nuclear program." Iran has repeatedly denied overseas media reports that it has tried to import uranium from countries like Kazakhstan and Zimbabwe.